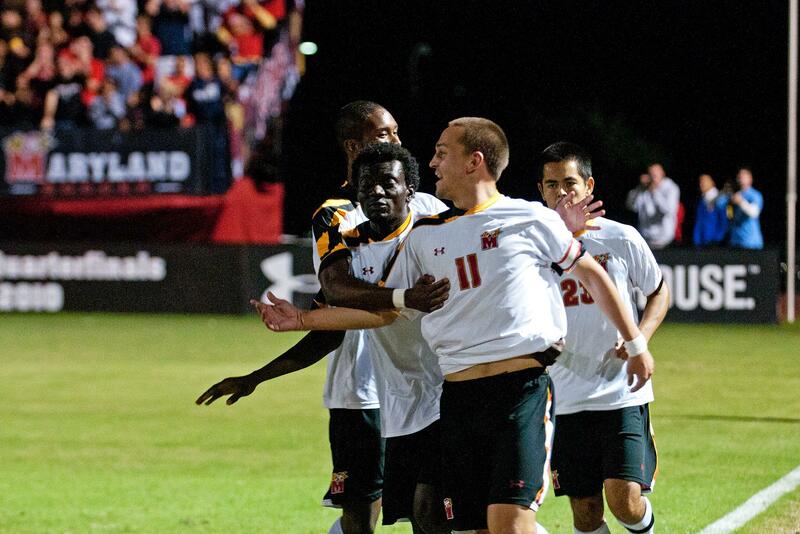 As the Maryland men’s soccer team headed into the locker room for halftime in their match against Division II Adelphi Tuesday, the Terrapins found themselves in unfamiliar territory. Not only were they tied on the scoreboard at zero, but the Terps were outshot in a half, 4-3 by the Panthers, for just the second time all season. However, a more focused Maryland group emerged in the second half. The Terrapins outshot Adelphi 11-0 and used two goals from reserve forward Jake Pace in the 73rd and 74th minutes, respectively, to defeat the Panthers 2-0 in their final non-conference regular season game of the season. The goals were the first of Pace’s career. In helping to pitch Maryland’s seventh shutout of the season, freshman goalkeeper Keith Cardona earned his first career victory. After a 2-1 loss in Charlottesville last week, Maryland (12-1-1, 3-1-0 ACC) resumes ACC play tonight against the Duke Blue Devils (7-4-1, 3-1-1). Duke has not been defeated in seven straight games, the Blue Devils’ best run since 2006. During that stretch, the Blue Devils are 6-0-1 and have outscored opponents 24-9, the most goals Duke has scored in a seven-game stretch since 2004. The Blue Devils are tied with North Carolina on top of the ACC standings to move into the College Soccer News poll for the first time since August. Duke is ranked No. 24 in the nation. Tonight’s battle will feature two of the top strikers in the country. Duke’s Andrew Wenger leads the nation in both goals (15) and points (37). During the Blue Devils’ seven-game win streak, Wenger has scored 12 goals to go along with seven assists for 31 points. After a four-goal, one-assist performance in a pair of victories last week, he is was selected as the Disney Soccer/NSCAA, ACC and College Soccer News Men’s National Player of the Week. Wenger was also voted to the Soccer America Team of the Week for the second time this season. On the other side though, Maryland’s Casey Townsend is not far behind. Townsend has scored 12 goals for a total of 24 points this season, both of which rank second in the conference behind Wenger. However, while Wenger has accounted for 22 of Duke’s 29 goals, the Terps scoring attack is much more balanced. Townsend has accounted for 12 of Maryland’s 34 goals. John Stertzer is second on the Terrapins with nine goals and 21 points while Patrick Mullins has five goals for 12 points this year. This is the 70th matchup between Maryland and Duke. The Terrapins have a 44-22-3 lead in the all-time series, which dates back to 1949. However, both teams have five wins in the last 10 meetings with each other. Duke is 1-2-0 against Maryland under head coach John Kerr. The Blue Devils defeated the Terps in 2009 and have not lost consecutive regular season games to Maryland since 2006. With a 3-1-1 record in the ACC, Duke is off to its best start in conference play since 2006, which is the last time the Blue Devils captured the ACC title. This game features the top two offenses in the ACC. Maryland is averaging 2.43 goals per game to Duke’s 2.42. The Blue Devils’ 29 assists leads the ACC while the Terps are second with 28. Chris Tweed-Kent is tied for first on Duke with seven assists. Andrew Morales leads all ACC freshmen and is tied for 10th nationally with four assists. Sunny Jane leads Maryland with five assists. Duke has scored 15 goals against ACC opponents this year, the sixth-most by the Blue Devils in conference play all-time. The 2000 Blue Devils scored 19 goals against ACC foes, the most all-time by a Duke team. All four of Duke’s losses this season have come by one goal. The Blue Devils outshot each of their opponents in those games and have outshot all but three of its opponents this season. Duke is 5-1-1 in games in which they have scored first. The Blue Devils are 5-0 when leading at the half and 0-2 when trailing and 2-2-1 when tied. Duke has outscored their opponents by a 29-17 margin. They have 11 goals in the first half and 18 in the second half. The Blue Devils have scored at least one goal in the first half in six of their seven victories. Nick Palodichuk currently is tied for first among freshmen across the country with six goals and 15 points overall, both of which are second on the Blue Devils. Duke and Maryland have played two common opponent so far this season. Both teams earned wins over NC State and suffered losses to Virginia. The Terrapins are the fifth ranked team the Blue Devils have played this season. Duke is 0-3-1 and has been outscored 7-4 by ranked opponents. Maryland is 3-0 against ranked opponents this season. They have outshot ranked teams by a 46-20 margin. The Terps have outscored ranked opponents 14-2 this season. Against unranked teams, their margin is just 18-7. 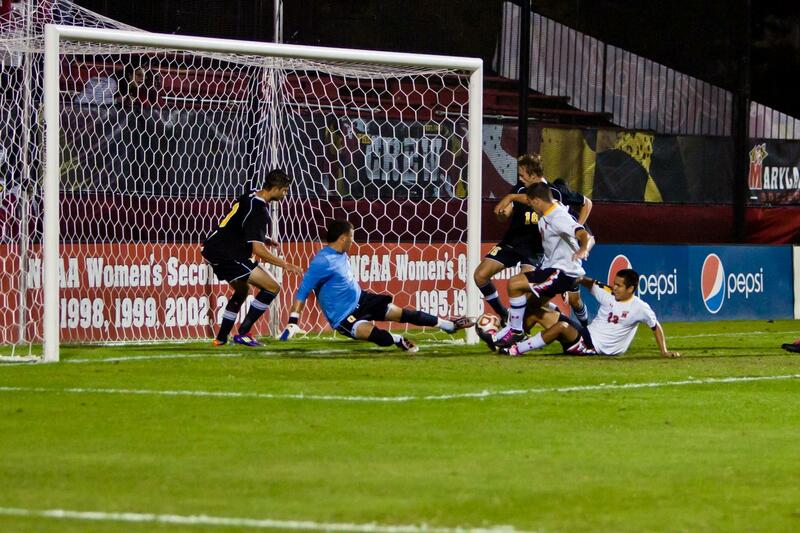 Maryland has outshot its opponents 244-122 this season, as well as outscoring them 34-10. The Terps have scored 15 goals in the first half and 17 in the second half, as well as two overtime goals. The Terrapins defense is surrendering just 0.71 goals per game, second in the ACC. They have allowed only 39 shots on goal all season. Maryland’s seven shutouts leads the ACC. 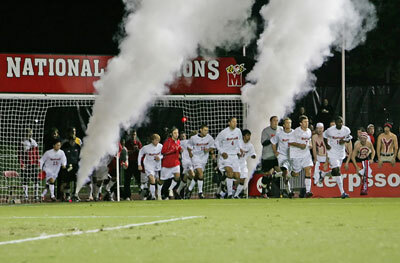 The Terps are 9-0-0 at home this and have allowed just five goals at Ludwig Field. Maryland is averaging 3,808 fans per game. You can listen to the action live on WMUC Sports at 6:45. Steve Goldstein will be on the call along with Luke Jackson. This entry was posted on October 14, 2011 by Scott Kornberg. It was filed under Maryland Terrapins, Soccer and was tagged with Andrew Wenger, Casey Townsend, Duke Blue Devils soccer, Duke soccer, Jake Pace, John Stertzer, Keith Cardona, Maryland men's soccer, Maryland soccer, Maryland Terps, Maryland Terps men's soccer, Maryland Terps soccer, Maryland Terrapins, Maryland Terrapins men's soccer, Maryland Terrapins soccer, Patrick Mullins, Scott Kornberg, Sunny Jane, Terps men's soccer, Terps soccer, Will Swaim.